Like King Canute attempting to hold back the tide, Philips has almost and/or finally given into the mighty iPod and released a flood of docks* for the Apple player. The 7 models range from the AJ300D bedroom FM clock radio dock to the DCM230 . The latter is a one-box Docking Entertainment System with USB Direct for those plucky few who've yet to have been assimilated by the iPod hordes - like Philips GoGear buyers for example. All of the docks are available in the UK now. Although some models may be familiar to US and European readers having been launched in these territories previously. 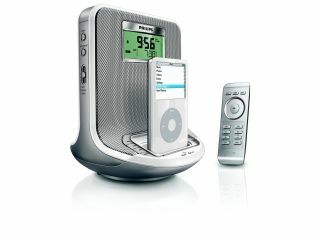 A simple iPod dock designed to accompany the now heavily discounted Philips Streamium WACS7000 wireless multiroom audio system. Bedroom clock dock with FM radio and built-in 2x 6W speakers. Docking Entertainment system with CD player, FM/AM radio and 2x 15W loudspeakers. Compatible with WMA and WMP3 encoded CDs too. Also supports other MP3 players via its USB Direct port. * To be fair anyone who can string a bunch of electronics together just has to make an iPod dock - there's too much money in it not to.